How cute are these? Other than their jacked up eyes. I should NOT have done them first. Or I could have outlined them. Everyone seemed to go crazy over owls a while back and I just didn't see the excitement until I made these owl cookies back in October. Then I just loved owls too. Had to even buy the babies some cute owl jammies. Well here are some Valentine's Day Owls. My teenage daughter Miss B and I decided instead of giving out Valentine's cards this year, she would give out Valentine's cookies to all her friends. Isn't that a cute idea?.....although now I've gotta make all the cookies. And when Miss B decided this.....my three year old Miss P decided she was going to need some for her dance class......FYI there is NO dance class. She pretends to have a class all the time and orders cookies from me. Too funny huh? Maybe when she gets older she will remember actually being in dancing school and I won't have to actually bring her to one. What do you think? Yeah, I didn't think so either. Now I'm getting the oven heated up for cookies for an imaginary class. Something simple.....maybe imaginary cookies? Just kidding, I couldn't do that to her. Do your kids do silly things like have imaginary classes? Please tell me she's normal....five kids and this is the first one who has an imaginary something. 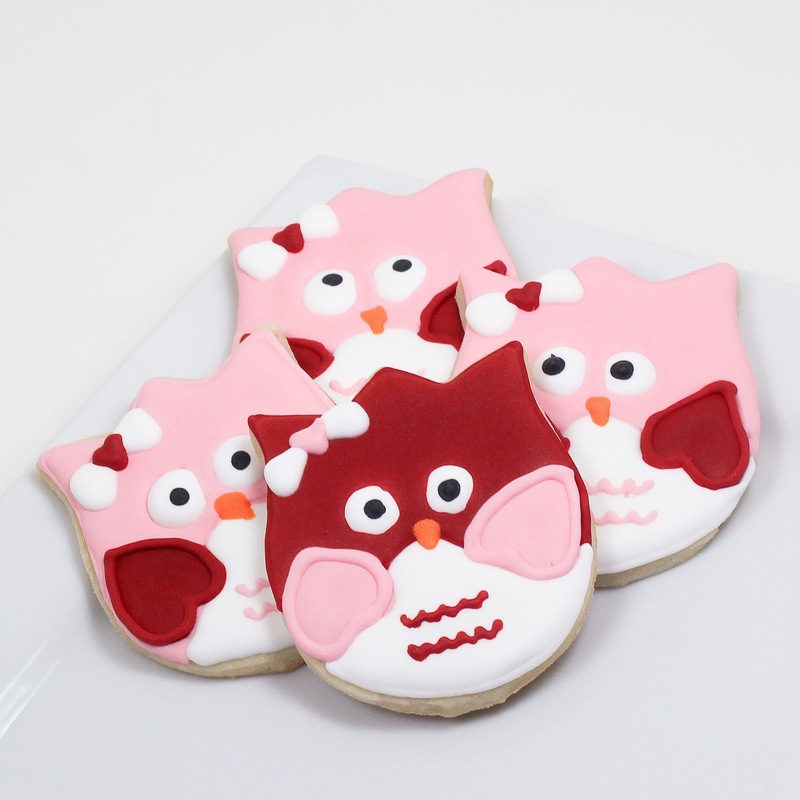 You could also make owl cookies with a heart cutter like Sweet Sugarbelle did here and just do them in red and white or pink and white. My grand daughter had an imaginary friend, 'MISTA SKINNA' when she was abou three. I had many almost heart attacks...most of the time did not "see" Mista Skinna, and sat on him. What an explosion and heart break, he nearly died once! When we took her home after a visit, we forgot to let him into the car, and had to arrange a lift for him to go to her!! These are so adorable!! I love owls and what a fun thing to do to decorate them for Valentine's day..
Great idea to make Valentine Owls-they turned out so cute. Sorry I'm so late, but I have to tell you these are so adorable! Love them! Great job Giselle! Honestly, not a fan of the current owl craze. But these are adorable! These will most certainly be making an appearance in our kitchen! Thanks for sharing!